Q&A: Has the “Countdown” Begun to End the Dollar’s Dominance Over the Global Economy? Attempts have emerged by some countries, especially Russia, China and the European Union, to replace the dollar with another currency in international transactions. Agreements have even been made to deal with the local currency of some countries, such as Russia’s agreement with India on 31/10/2018, for the sale of S-400 missiles in the Russian currency. And its agreement with Turkey a month ago to use the currencies of the two countries in a similar missile deal. At Erdogan’s meeting during the summit of the Turkish-speaking countries … China announced that it will pay for its imports of Iranian oil in “petro-yuan” and the Central Bank of China signed a bilateral agreement to exchange the local currency with its counterpart in Japan, a 200 billion yuan ($29 billion) in return for 3.4 trillion yen ($31 billion). Has the “countdown” begun to end the dollar’s dominance over the global economy? The Nixon administration then dealt with this new financial change through a series of agreements with Saudi Arabia from 1972 to 1974, and found the so-called “petro-dollar”, giving foreign countries another convincing reason for the accumulation and use of the dollar because of their need for the oil which is priced in dollars according to agreements with Saudi Arabia, the largest oil producer in the world. Saudi Arabia also agreed to recycle billions of US dollars of oil revenues through US arms manufacturers, infrastructure and the purchase of US Treasury’s bonds. By 1977, at least 20 percent of all Treasury bonds abroad were in the hands of Saudi Arabia … If oil is added to gold, which is also priced in dollars, countries were therefore keen to get the dollar. The ratio of cash reserves in dollars in global central banks was about 71% until 2000, but dropped after this year to 62%, also 40% of global debt is denominated in dollars. Second: Today, the US dollar dominates international transactions. This created a huge artificial market for the US dollar, which distinguishes the US dollar from each domestic currency. The dollar has become an intermediary in countless transactions amounting to more than $5.4 trillion a day, unrelated to US products or services … What is striking is that the dollar represents 84.9% of daily foreign exchange transactions, despite America’s own trade transactions is less than half of this ratio, because non-American countries deal in dollars in their business matters! The strength of the economic dollar has meant that America is able to punish the economically and financially targeted nation not only that, but also to discourage other countries from trading with the target country. America is able to achieve this tough action through the SWIFT system: (The Society for Worldwide Interbank Financial Telecommunication). It is the dollar settlement system. Since the dollar is the global reserve currency, SWIFT facilitates the international dollar system. Countries around the world settle transactions through it, ensuring that all bilateral transactions are based on the dollar. For example, Russia and China cannot exchange goods and services in their domestic currencies unless US dollar transactions are settled through SWIFT. America can use the system to impose severe economic sanctions. Under this system, America banned, between 2014 and 2015, many of the Russian banks from SWIFT when there was deterioration in relations between the two countries. In November 2018, the United States reintroduced strict sanctions against Iran using SWIFT. Several European companies refused to fulfill their dealings with Iran for fear of America. Third: In light of this, the countries of the world with weight and importance launched two ways to reduce the impact of the dollar. The first is the European position in 1999, when the euro was officially traded with, in 2002 in competition with the dollar. This was due to the strength of the European economies and their confidence in competitiveness. The second is through countries, such as Russia and China, whose efforts were late to curb the dollar’s dominance; this is because of their inability to compete at the time (until the launch of the euro) until the financial crisis of 2008. They feared the erosion of their dollar reserves and the loss of their value. They joined the old European countries in reducing the dollar’s dominance. Since China has become a world-class economy, the international efforts started to affect the dominance of the dollar. Thus, the 2008 economic crisis was a wake-up call to countries to think about the dollar as a result of the crisis. But what made this step faster is Trump’s provocations and sanctions. The new policy pursued by President Trump’s administration has accelerated the tendency of other major powers to curb the dominance of the US dollar globally. President Trump’s policy carried with insolence the slogan of “America First”, although all American administrations were certainly working for the American interest, but the Trump administration is close to not recognizing the interests of other countries. Trump demanded Europe to pay retroactively for US military protection and launched strong sparks threatening to ignite a trade war with China. He demanded that Japan and South Korea pay for protection from the North Korean missiles. When President Trump imposed sanctions on Iran, making them include anyone using dollars to buy Iranian oil, and because China is now the world’s largest oil importer, Trump’s actions prompted China to take action to stop the use of the dollar, especially since it is in a trade war with the United States. Thus, in March 2018, the Shanghai Futures Exchange launched its first open-ended futures contract for foreign investors. The contract, a forward oil contract, was denominated in yuan to be a rival to Brent and WTI based on the dollar, which are used as the current standards. So the 2008 financial crisis, its reflection on the economies of many countries and its impact on this crisis, followed by Trump’s protectionism, trade war, and financial and economic policies … all have accelerated trends against the dollar’s dominance. A- Russia: In 2009, Russian President Medvedev proposed a new “global currency” at the G8 summit in London as an alternative reserve currency to replace the dollar. China, Russia, India, Turkey and other oil-producing countries have recently agreed to “conduct all their trade and investment transactions in their own currency.” But despite all this, the price of gold and crude oil remains in dollars! Russia’s repeated statements of the replacement of the dollar with other national currencies and receiving the price of the Russian oil in currencies other than the dollar is due to US sanctions on Russia after its invasion and occupation of the Crimea and eastern Ukraine in 2015. It is also a consequence of the investigation into Russia’s intervention in the US elections of 2016. However, the Russian ruble cannot replace the dollar, because the lack of confidence in the ruble does not help it to mobilize countries with weight to stand by it. This is because many countries in the world do not want to buy the ruble as it fluctuates widely in currency markets, and mainly because the world has no confidence in the Russian ruble as a reserve currency. So what Russia can do most is to push some countries to pay for their Russian energy purchases with the ruble, but the Russian currency cannot replace the dollar … Putin’s spokesman Dimitry Peskov said in an interview with Rossiya TV channel. “Cancelling the dollar is possible to some extent, but it is not about whether you want to exit the dollar zone, but what is the alternative then: the euro? The yuan? Or Bitcoin?” “Every one of these options has its own costs, we have to balance the costs of staying with the dollar and the costs of finding a new position,” said Oreshkin, a former vice president of the Central Bank of Russia (Financial Times, 3/10/2018). All of which indicates that Russian officials themselves are not convinced that the ruble is fit as a global currency instead of the dollar! B- China: China can make its yuan currency a strong competitor globally, but its global political horizon is narrow, thus affecting its narrow global economic horizon in terms of competition and conflict with America. Therefore, it could not impose its currency globally in trade and financial markets despite of the size of its large economy, but it adopted the dollar, and collected it in huge amounts ranged in recent years between 3 and 4 trillion dollars! Although it made attempts to move away from the US financial institutions, and it formed the economic group BRIX with Russia, India, Brazil and then South Africa. The total economic size of the BRIX Group exceeded $ 15 trillion, equivalent to 20% of the global economy of $ 74 trillion …it also established a development bank for financing and lending (for the BRIC group) in July 2015 in Shanghai with a capital of $ 50 billion to finally reach $ 100 billion as an alternative to the World Bank, yet it did not give up the dollar! When President Trump imposed sanctions on Iran and made them include anyone who uses dollars to buy Iranian oil, and because China is now the world’s largest oil importer, Trump’s behaviour is what prompted China to take action to stop the use of the dollar, especially since it is in a trade war with America. Therefore, in March 2018, the Shanghai Futures Exchange launched its first open futures contract for foreign investors. This contract, a forward oil contract, was denominated in yuan to compete with the Brent and WTI contracts, denominated in dollars, which are used as current standards, all of the above measures are significant and can destabilize the dollar. What limits the hard work of China to effectively remove or destabilize the dollar is its heavy interdependence on the US economy and dollar. The US-China trade volume is very large at $ 500 billion a year and now it has $ 1170 billion in US Treasury bonds (Chinese financial newspaper Xinhua website 20/9/2018) down from $ 1,300 billion in 2013, the world’s largest holder of those bonds. China’s reserves of dollars are between 3 and 4 trillion dollars added to China exports to the world in 2016, worth $ 2.1 trillion and it imported $ 1.6 trillion according to the World Trade Organization, making it the second largest commercial giant in the world after the United States. .. Thus, the intensity of their trade in dollars, in addition to Treasury bonds, makes them take one step forward and one step back in the serious work to destabilize the dollar. America’s success in attracting China to international trade in dollars has made China more interested in not shaking the dollar. It is aware that it will be the world’s biggest victim of the dollar’s shake-up; this pushes it to reduce its role slowly and carefully to keep its large stocks of dollars and bonds. And even if all of China’s trade becomes with Russia away from the dollar, this does not solve the problem because the size of the trade of 120 billion dollars a year in both directions (Arabic China 23/9/2018) remains limited in comparison to the world trade, which is more than $20 trillion annually. Thus, China is less bold than Russia and more cautious in its quest to curb the dollar’s dominance. China seems to have realized the damage of dealing with the dollar, both in terms of the intensity of its stocks of dollars or in terms of US Treasury bonds, etc. It became the world’s most gold-buying country, its gold stocks rose from 600 tons in 2008 to 1842 tons in 2018. This explains the big drop in its dollar reserves, which reached a peak in 2014 and exceeded 4 trillion dollars (Trading Economics website). Note that China has bought more than 700 tons of gold in 2015 alone. As for US Treasuries, after the 2008 financial crisis, China went for their sale. The value of its holdings declined during the two years following the crisis, but the American threat to block China’s trade, which emerged at the time in the issue of the safety of toys exported from China to America, made it return to getting more dollars. This continued until it peaked in 2013, but China returned to sell on the backdrop of the trade threat from the Trump Administration. However, with all of this, the density of China’s stocks of dollars, bonds, etc. makes its dollar-removing work ineffective; this is why the Yuan accounts for only 1.7% of international payments, compared to 40% for the US dollar. In 1999, the euro emerged; it was used in banks and replaced local currencies of certain countries as an alternative currency in the European Union starting from 2002. It attempted to compete with the dollar, because behind it stands globally strong economic countries such as Germany and France, joined by other industrialized and rich countries. Thus the euro became globally strong currency. And behind stands a collective force that can have a global political impact that competes with America, and has the potential to build a strong independent army as it seeks. The euro has been a reserve in international central banks by 20-23 percent. But one of the main factors preventing the euro from dominating the global economy is the weakness of Europe’s political, military and economic influence facing America. The European Union itself is still in the defense of its existence, as there are threats that are not easily threatening its existence, and the exit of Britain from it was a shock of confidence as well as the rise of separatist racist movements in its countries, with demands of secession from the Union, which weakened the confidence in the Union… In addition to disunity in the political decision, are all factors that reflect the euro’s currency and confidence in it. – In October 2018, China and Japan agreed to a $30 billion currency swap, Japan’s largest deal. “The contract to supply the S-400 missile system to India will be made using the Russian ruble currency,” Russian Deputy Prime Minister Yury Borisov said on 31/10/2018. This statement has no reality, and is far from becoming a reality, because Turkey is essentially trading with the EU! 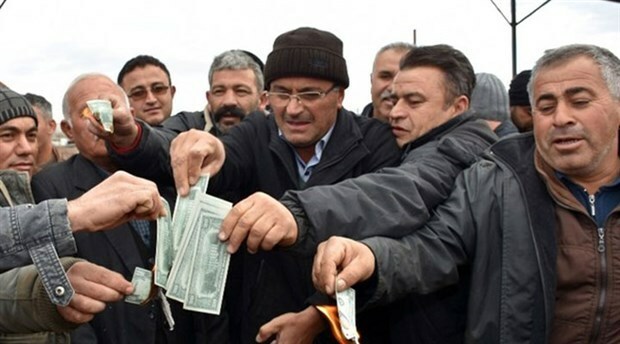 However, Turkey trades in dollars, borrows in dollars and most of its reserves of foreign currency is in dollars, and imported oil, natural gas and imported raw materials are all in dollars … We saw Turkey when America lifted the sanctions after the American pastor was freed, things returned to normal, and it lost enthusiasm of giving priority to dealing in local currencies before the lifting of sanctions… As for the Turkish-speaking countries in Central Asia, they follow the Russian policy, and the Turkish trade with them even if they were exchanged in local currencies do not amount to the influential figures in world trade due to the marginal economy of Central Asian countries. Iran is banned from dealing with the dollar because of the harsh financial sanctions imposed on it for many years after being taken out of the American banking system … But after the lifting of the sanctions in 2015, it was selling its oil in dollars and signed large contracts with international companies, including European companies such as Airbus and Total the French company in dollars exclusively, as if nothing has happened! The sanctions and their lifting affect Iran’s actions in a timely manner. America is the one who enters or exits Iran from the dollar trading system SWIFT. When America increases its anti-Iranian statements and closes its doors to the dollar, Iran’s response is statements that it will not be dealing in dollars. As for India, since the old times it imports Russian arms and America does not mind that. India has a special place to America because it wants it to be an important force to counter the increasing influence of China in Asia. India knows that, so India is not expected to seek to change the dollar to the ruble or the yuan as a global currency. Japan, which is linked to America, does not need to be detailed. Its dealing with Russia does not mean that they are against the dollar or that they accept the ruble as an alternative to the dollar. In conclusion, the countries that can be said to have an effective impact on the dollar’s removal from its position are Russia, China and the European Union. But each of these countries have factors that weaken their movement as we have clarified, but if they get rid of those factors, they can remove the dollar from its position. If they do not work hard on this matter, they will be shocked by the so-called “weak dollar” and their wealth of dollar reserves will disappear. America is suffering a great deal of debt. According to Washington Examiner, the American magazine, on 1/10/2018, “US government debt rose by more than $ 1.2 trillion during the fiscal year that ended on 30 September 2018 according to a government site that keeps track of debt. The accumulation of American indebtedness over decades has brought the country into a financial predicament. As this accumulation accelerated after the 2008 crisis, increasing from $8 trillion to $21 trillion today, the American financial predicament has become acute, which Bolton called a threat to national security, and needs quick solutions, i.e. in the near and medium, but not the long term… In light of this reality, the remaining solution for America to manage its finances is to pump more liquidity (printing dollars). Injecting liquidity in quantities that meet state funding, let alone repaying its debts, which will lead to a collapse of the dollar, or what the US Treasury Secretary called “a weak dollar”, meaning the loss of a part of the wealth of the countries of the world dealing with the dollar in their trade, the reserves of their currency, and the US treasury bonds, a loss as much as the weakening of the dollar, which will be a blow to those countries!